Edward Shippen III (1703-1781) was Lancaster’s leading citizen and chief magistrate in December 1763. He reported the murders at Conestoga Indiantown to Governor John Penn on December 14, took the surviving Conestogas into custody at the Lancaster jail, recommended that provincial authorities move survivors to Philadelphia (which did not occur), and responded to the Paxton Boys’ excursion into Lancaster on December 27. But Shippen was more involved than even these facts might suggest: the Paxton Boys planned their December 14 attack as a message to Shippen himself. As the Paxton Boys saw it, they sacrificed themselves on the frontier while Shippen lived in luxury in Lancaster and refused to send militia to help protect their settlements. The Paxton Boys even rode to Shippen’s home in Lancaster. They confronted him directly, boasting of the murders they planned to commit, before they rode to Indiantown. The Paxton Boys intended for their December 14 massacre to function as a direct challenge to Shippen and other Lancaster elites. Edward Shippen III was born in Boston, where his grandfather, Edward Shippen I (1639-1712), was a successful merchant. In 1694 Edward Shippen I moved to Philadelphia where he quickly became the speaker of the Pennsylvania Assembly, a member of the Governor’s Council, the first mayor of Philadelphia, and the chief justice of Pennsylvania. His sons Edward II and Joseph—and Joseph’s young son, Edward Shippen III—followed him to Philadelphia in the first decade of the eighteenth century. 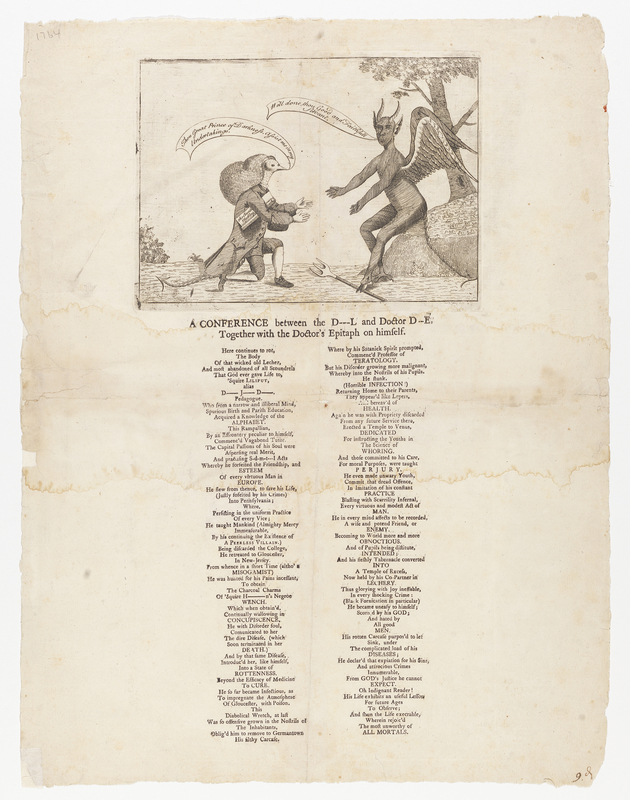 Joseph retired from business in 1716 and settled as a gentleman on his estate in Germantown—but he apprenticed his son to James Logan (1674-1751). 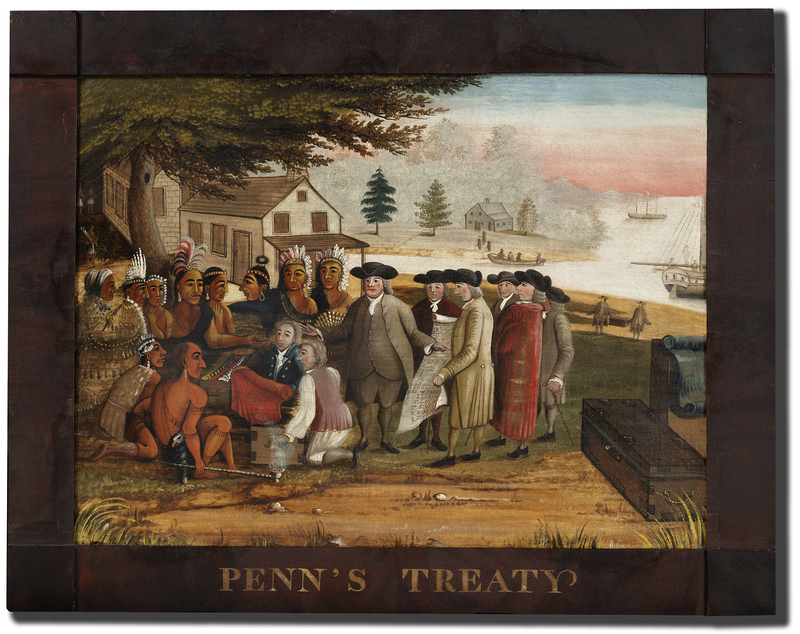 William Penn’s colonial secretary and the colony’s land agent, Logan controlled the fur trade along the Susquehanna River and had established a trading post at Conestoga Manor. Edward Shippen III became Logan’s partner by 1731 and purchased substantial land west of the Susquehanna, which he dubbed Shippensburg, and on which he settled traders in 1737. He was elected Philadelphia’s mayor in 1744 and was one of the founders of the College of New Jersey (later Princeton), established in 1746 to train Presbyterian ministers. 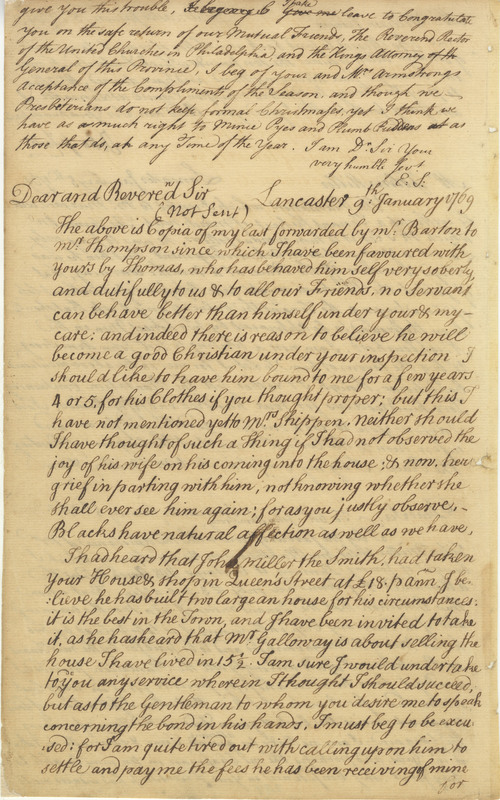 Shippen moved his family to Lancaster in 1753 after the governor appointed him to lucrative offices that, he told his son, were worth £500 a year. Shippen collected the ground rents in Lancaster for James Hamilton, who had founded Lancaster in 1730, and he joined a small English-speaking elite, the proprietary party, in a city that (like the county as a whole) was largely populated by German immigrants. 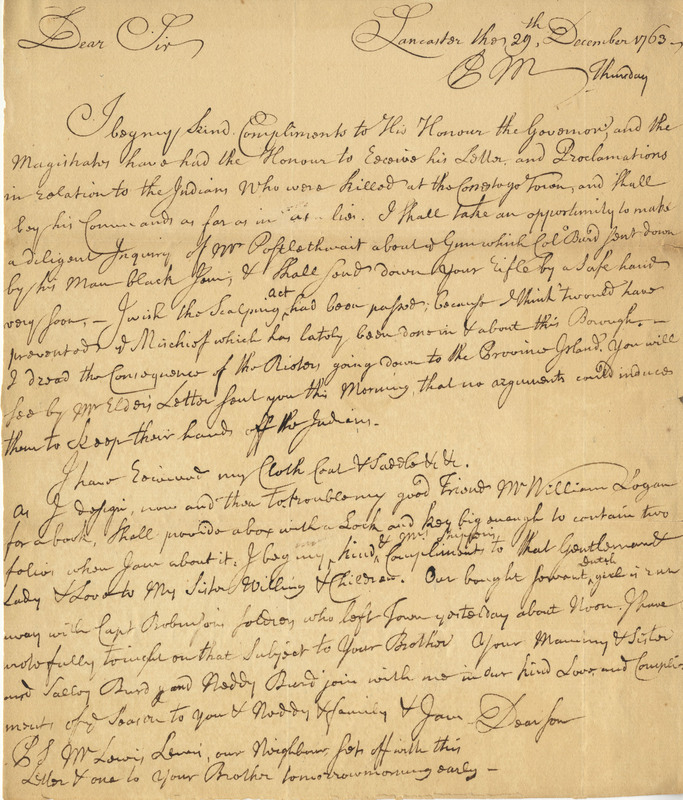 His family connections were extensive: his cousin William Allen (1704-1780), generally considered the richest man in Pennsylvania, served as the colony’s chief justice. Most of these English-speaking families worshiped at Lancaster’s Anglican church, St. James, and, despite his long-standing Presbyterian affiliation, Shippen attended Anglican services there. Shippen’s position in the mid 1750s as paymaster and commissary of British and provincial troops under General John Forbes and Colonel Henry Bouquet solidified his position at the center of Lancaster society. In that role he earned substantial remuneration and controlled many opportunities for patronage. 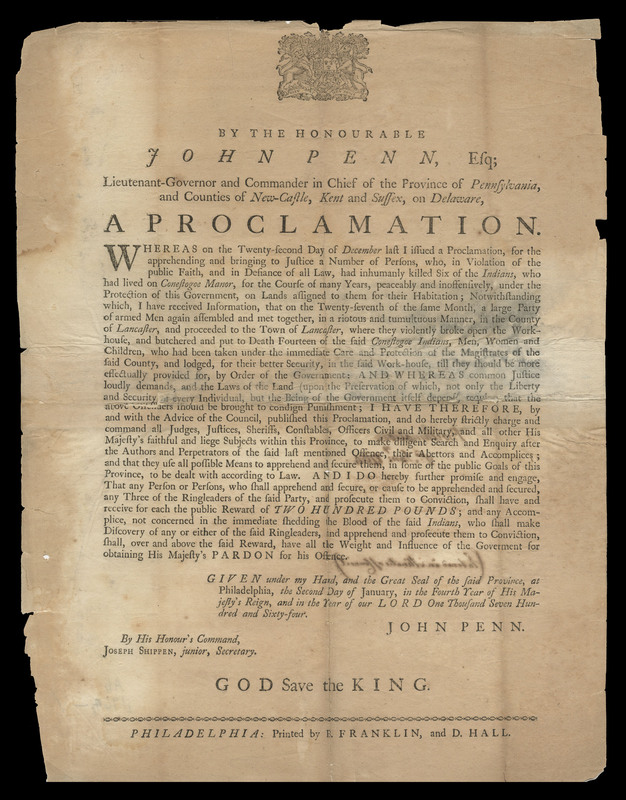 Promised a 2½ percent commission on all expenditures during the campaign, Shippen doled out thousands of pounds between 1757 and 1759. By the 1760s, Shippen was Lancaster’s wealthiest and most prominent citizen. Like many members of his extended family, Edward Shippen grew wary of the unrest of the early 1770s. His children filled positions of importance in colonial Pennsylvania, and most historians depict him and his family as hedging their bets during the Revolution. Edward Shippen IV (1729-1806), who studied law in London, served on Philadelphia’s common council and acted as clerk for the colony’s supreme court. 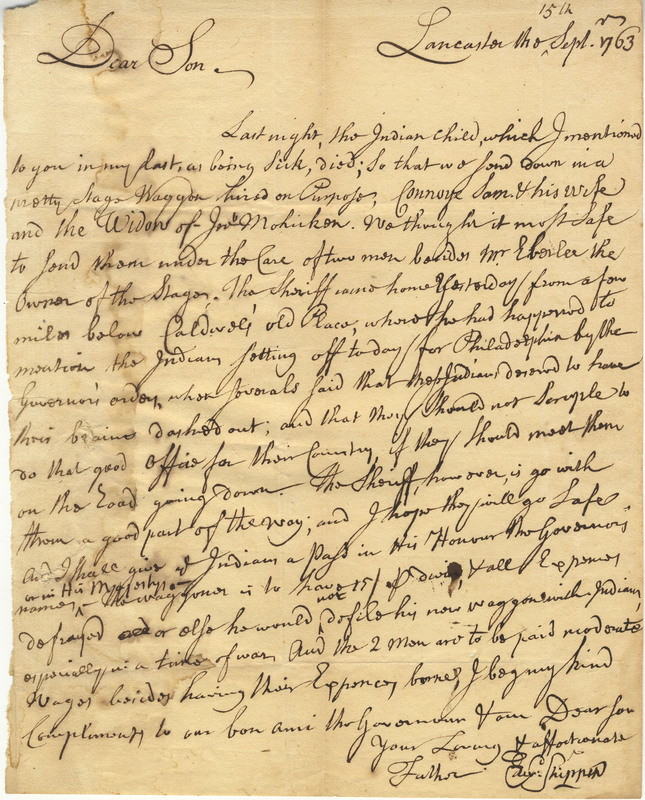 (His daughter, Margaret, would marry Benedict Arnold in 1779.) Joseph Shippen (1732-1810) served as colonel during the French and Indian War and then as colonial secretary. Shippen’s son-in-law, James Burd (1724-1793), married to Sarah Shippen (1730-1784), also served as a colonel during the French and Indian War and later as a magistrate in Lancaster. All these men depended on the patronage of the Penn family. Nevertheless, Edward Shippen III, already past seventy years old, became the chairman of Lancaster County’s revolutionary Committee of Observation and Inspection from its establishment in 1774 until 1775 and he continued to serve on the committee until it was disbanded in 1777. The elimination of proprietary government deprived Shippen of all the many offices he held and, in his last years, he worried about his financial situation. He died in Lancaster in 1781. 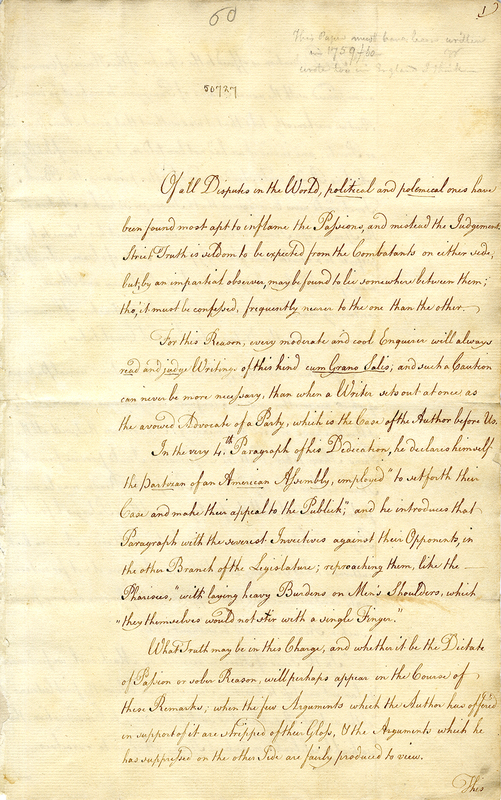 Visit the Edward Shippen path to access 20 manuscripts available at the American Philosophical Society. For more about Scott Paul Gordon, visit the Creators page. Scott Paul Gordon, “The Paxton Boys and Edward Shippen: Defiance and Deference on a Collapsing Frontier,” Early American Studies 14, no. 2 (2016): 319-347. John Woolf Jordan, “Shippen Family,” in Colonial and Revolutionary Families in Pennsylvania: Genealogical and Personal Memoirs, 3 vols. (New York: Lewis Publishing Company, 1911), 1: 96-109. Randolph Shipley Klein, Portrait of an Early American Family: The Shippens of Pennsylvania Across Five Generations (Philadelphia: University of Pennsylvania Press, 1975). 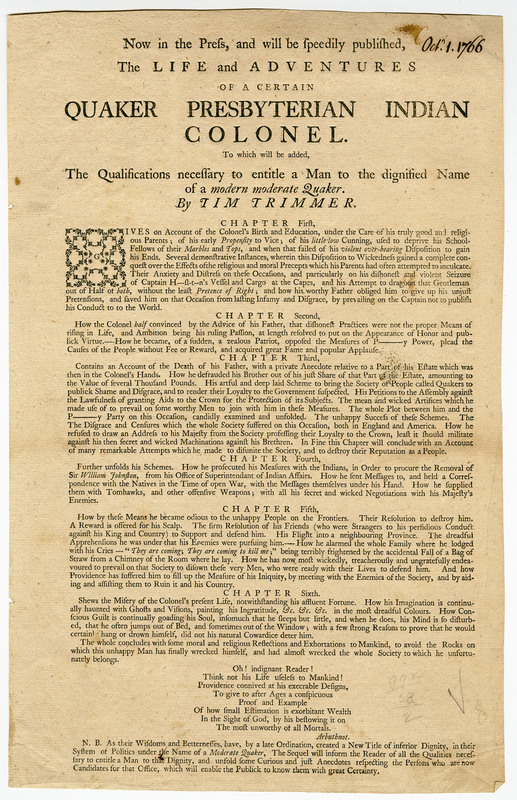 Joseph Shippen, “Military Letters of Captain Joseph Shippen of the Provincial Service, 1756-1758,” The Pennsylvania Magazine of History and Biography 36, no. 3 (1912): 367-78 and no. 4 (1912): 385-463. 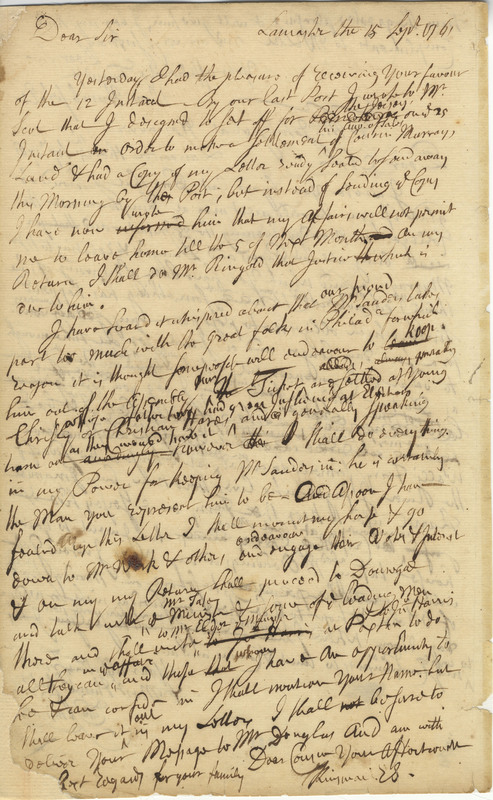 Edward Shippen Letters and Papers, 1727–81, Mss.B.Sh62, American Philosophical Society. 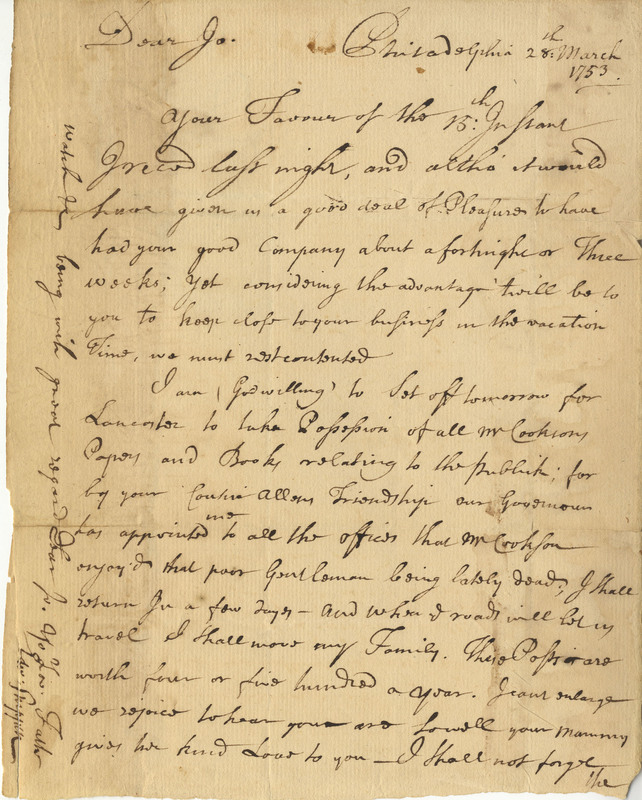 Shippen Family Papers, Collection 595A, Historical Society of Pennsylvania.